God, I wish I had written those lines. They are so pure. So full of passion. So honest and stripped bare of pretense. And, for me, they sum up so much of the feeling that I have as a person who continues to seek full-time employment. During the past five years since the beginning of the recession, I’ve been laid off twice, had one false start at a new career path and been invited on more than 25 interviews. But despite all that has occurred, I have not lost my faith. I believe in my mission, and that mission is to become gainfully employed in my chosen field. But some time during those five years, 50 became the new 60 and not the new 40. Employers look at you askance when they stack your resume up to your counterparts who are decades younger. Why should we hire you, you over-qualified codger, you’ll be here and gone in no time when another offer comes along? I think every job-seeker, regardless of their age, needs someone to believe in them. They need someone to see the abilities and promise that they possess and to give them a chance to shine. But I didn’t write the words that began this post. They came from former Army Ranger Justin Slaby, who has filed a federal lawsuit against the FBI after he was dropped from the bureau’s agent training program. The story of Slaby, who served two tours in Iraq and one in Afghanistan before his left hand was blown off by a faulty grenade during a training exercise, was told in a recent NPR interview. Slaby’s attorney said he passed the FBI entrance exam, including weapons proficiency, in fine fashion. But when he reached the training program in Quantico, the trouble began, the story said. Within six weeks he was out because the trainers said he couldn’t handle firearms. He just needed a chance and somebody to believe in him. That somebody, the NPR story said, was FBI Agent Mark Crider who had originally approved Slaby for the program. Crider, however, faced problems of his own when he was subpoenaed to testify in the case, the NPR story goes. His boss called him in, and Crider said in a deposition that he was pressured not to side with Slaby. Things have taken many twists and turns from there, but Slaby perseveres. His case for reinstatement began on July 29 in Virginia. In his July 15 post, “The One Thing Successful People Never Do,” author Bernard Marr wrote that the one thing successful people never do is give up. Obviously, Slaby isn’t giving up, and neither should you. “Despite all that has occurred, I have not lost my faith in this organization, and I believe in its mission. I just need someone out there to believe in me.” Slaby wrote these words in his original appeal of the FBI’s decision. Remember. Never lose faith in yourself. Believe in your mission. 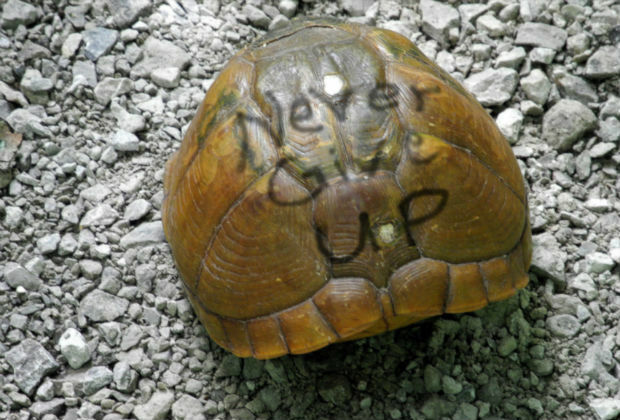 And never, ever give up. For more from Greg, check out Xogdog’s Blog. And here is a great story about how personal struggle can launch a business.